Why Are There Different Violin Sizes? If you've ever shopped for violins, you've probably noticed there are TONS of different sizes: 4/4, 3/4, 1/2, 1/4, 1/8...etc. The reason for this is because your technique on the violin will be affected by your arm length. Young students who try to play a full sized violin will end up stretching their arm too far to reach the neck of the violin, which changes the angle of their elbow, arm, and wrist. This will not only be uncomfortable, but it will cause all sorts of technique problems down the line! Just to give you a reference, most young beginner students (ages 4-6) start off on a 1/4 size or a 1/8 size, though the sizes do go even smaller than that! By middle school age, most have graduated to a 3/4 size violin and high school students are usually playing a full sized violin. Of course, these are generalizations and it all depends on the size of the student! If you're an adult, you'll need a full sized violin (Sometimes called 4/4). The length of the violin isn't the only thing that's different in the smaller sized violins — the bow is also shorter. A student with a shorter arm wouldn't be able to use the entire length of a full-sized bow, so the smaller bow makes it easier to manage. Now there are downsides to playing a smaller violin. Smaller violins tend to have a much less full sound, since there is less room for the sound to resonate. But I normally tell my students: the sound you make is 95% your technique and skill level and 5% the instrument itself. So focus on your technique and don't worry too much if you don't have the full, rich sound of a full-sized violin! To figure out what size violin your child will need, you'll need to measure their arm length. You can either use a tape measure or you can hold up the violin to your child's arm. Place the violin against their neck and have them hold out their arm completely straight. The violin should end between somewhere between their wrist and the center of their palm. During the first lesson, I measure my students' arms and help them figure out what size violin they'll need. 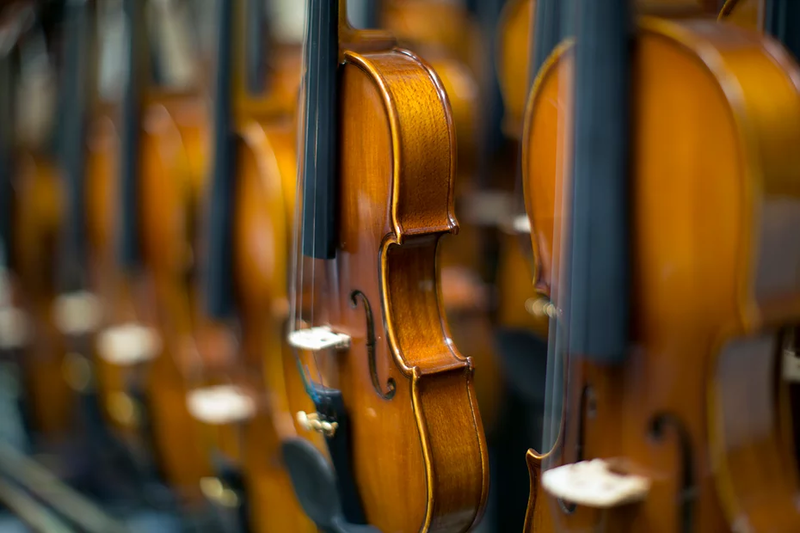 But if you're anxious to get your violin, the people over at Keller Strings will help measure your child and get them set up with their first violin! Ready to sign up for your first lesson? Fill out the contact form at the bottom of this page and we'll get back to you right away to schedule your lesson time!